These photos, accompanied by analyses, afford examples of how plant form and texture are treated in landscape design. Learn about some of the popular plant forms, and how to use them. Discover what "texture" means in the context of landscape design. View examples both of contrast in plant selection, as well as continuity—and what effect each can have on the viewer's perception of the landscape. Clicking on the pictures below will take you to larger images and explanations of their significance. In landscape design terminology, "form" is the shape of a plant. Upright, oval, columnar, spreading, broadly spreading, arching/fountain-shaped and weeping are all examples of ​the form. 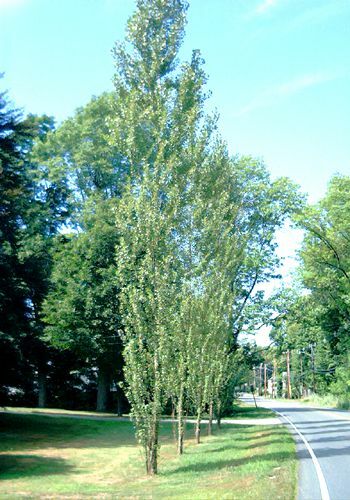 Lombardy poplars are examples of trees with a columnar form. Their stiffly upright branching pattern only adds to the effect. Most people prefer the look of forsythia that is allowed to grow in this natural form, as in the photo above. Example of a Cascading Form or "Habit"
The plant form (growth habit) for the ground cover, ​creeping phlox, for example, is often termed "cascading." The equivalent term for a shrub that functions as a ground cover would be "broadly spreading" (for instance, for creeping juniper shrubs). Why is it important to think about plant forms...? When you have studied up a bit on plant forms and made yourself aware of some of the options available, there are basically a couple of ways you can go. This photo illustrates one way: namely, you can integrate different plant forms in the same bed in order to achieve contrast or variation. Notice that there are weeping, upright and spreading forms in the example shown here. But in the photo above, we see contrast on multiple levels. The shrubs in question (burning bush and hemlocks) display not only a different shape and branching pattern (i.e., form), but also a marked contrast in color. Furthermore, they exhibit different textures: one is tightly packed with very small needles (indistinguishable from a distance, in fact), while the other features foliage of a more moderate size. By employing repetition— i.e., installing plants that bear the same form or other characteristics—you can help achieve unity in your design. Perhaps the ultimate example is the classic hedge (composed of one plant), as in the photo above of a privet hedge. Formal hedges can have such a unified look that they essentially function as "living walls" in a landscape design. The formal privet hedge in the picture above serves double-duty, disguising an eyesore: the chain-link fence. Weeping trees, for instance, can convey a feeling of luxuriance or mystery. One weeping tree in the yard shown here probably wouldn't have been sufficient to convey this feeling, but having the two weeping trees (a weeping cherry and a weeping Japanese maple) in such a small space creates a powerful impression. Relative leaf size, in fact, is so important that it warrants a term all to itself: "texture." That is, the size of a plant's leaves (relative to what's around it) influence how its texture will be perceived: relatively large leaves give a plant a "coarse" texture (the zinnia, here), while relatively small leaves create the impression of a "fine" texture (the cosmos, here). In addition, we tend to perceive the texture of plants with a lacey leaf form, such as cosmos, as being fine. Sometimes, it's nice to know what some of your "extreme" options are. For instance, when we looked at an example of a columnar form in an earlier photo, we saw the extreme form of the Lombardy poplar. That is, the rocks themselves will usually suggest a texture coarser than that of the accompanying plants. But in the rock garden in the picture above, the designer has "gone the extra mile," injecting some interesting contrast between the plants, too. But beyond this fundamental distinction, note how differently texture is used—and to what effect. In the photo above, plant selection was made with an eye to continuity in texture. It's almost two-dimensional, a perception aided by the short heights of the plants. Specifically, a fine texture. The effect of the resulting continuity is this: that the shrubs form a unified backdrop for the plants growing in front of them. We say "backdrop" in the sense that there's nothing jarring in the shrub planting that would draw the eye to this or that shrub. As a result, the viewer's attention tends to gravitate to the flowers growing in the foreground. Mind you, contrasting textures and similar textures are the extremes, to be saved for "special effects"; in general, you should be striving for a gradual transition between the textures of plant materials. Let a medium-textured plant bridge the gap between a fine-textured plant and a coarse-textured plant. Ornamental grass offers a distinctive, blade-like leaf form. Anyone interested in achieving plantings with variation in form should be aware of the options offered by ornamental grass. In the photo above, the spikey leaf form of the ornamental grass contrasts nicely with the rounded leaf form of the weeping tree (Harry Lauder's walking stick). But in the window box pictured above, the variation in the form supplied by the ornamental grass lends added interest to the planting.